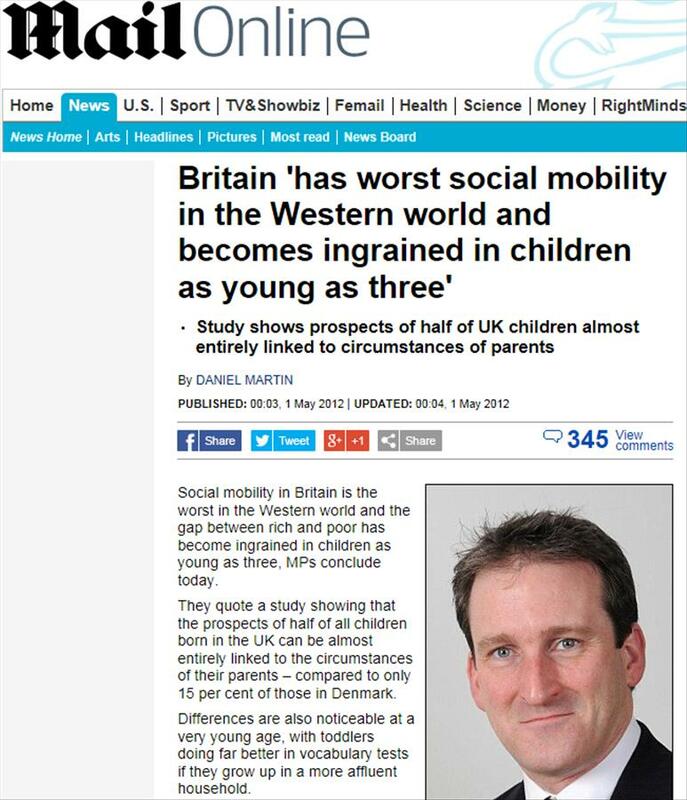 Yesterday I wrote a post about how the Daily Mail hates Britain. As you will see if you view the video clips below, on Tuesday night’s excellent Newsnight there was an interview with Jon Steafel, deputy editor of the Daily Mail, during which he was asked 11 times by Alistair Campbell to personally endorse the headline “Ralph Miliband hates Britain” – he refused to do so. That should tell you all you need to know about what is really going on here. The Mail article, for what it is worth, is easily amongst the worst examples of writing (It cannot be described as real journalism) that this blog has had the misfortune to read in some time. It is the very definition of literary excrement. Wholly bereft of cogent thought, it does not quite know what point, apart from “Socialists hate Britain” (the author fails to identify any trait that is uniquely specific to Miliband as opposed to strident socialists per se) that it is trying to make. Even in its childlike attempt to besmirch Miliband’s “Marxism” the author of the piece ties himself up in knots. Of course, he could only embark on this ‘adventure’ because of the protection, the education and, crucially, the political freedom, that this country gave him. In the above excerpt from the Mail’s tirade, note how the Mail extolls the virtues of our “political freedom’ whilst in the same sentence using it to condemn Ralph Miliband’s exercise of that right to freely express his political viewpoint. A viewpoint shared by millions in the UK at that time, especially within the Labour party, right up to the election of Margaret Thatcher and beyond. 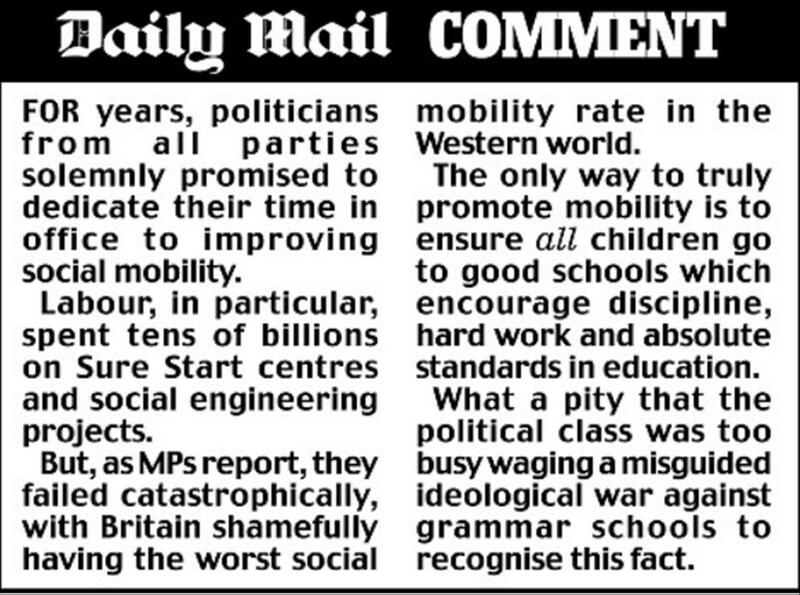 One can only imagine that the Daily Mail thinks that Michael Foot, John Smith, Jim Callaghan and even Tony Blair must have hated Britain too, as they were all signed-up to membership of the Labour party under the old version of Clause IV – you know, the one that talked about the “common ownership of the means of production, distribution and exchange”. Controversially, the MPs call for more intervention in the lives of under-threes. The report also shows that despite all the money spent to get more teenagers into university, the access gap between rich and poor has actually widened in recent years. I have demonstrated with nothing more than a cursory overview of a couple of paragraphs of the Mail’s bilge, that it is all too easy to poke huge holes in its paper thin veneer of ‘robust’ journalism. It is sad and rather pathetic that people are prepared to pay for this hokum. Nonetheless, today the Mail has continued in its despicable campaign against a politician’s dead father. Why? We cannot be sure but when a national opinion sheet spends three days creating news and embarrassingly tying itself up in (non-)intellectual knots in trying to justify itself one has to assume that it has lost any sense of what is reasonable, decent and (dare I say) British about its actions. You might think that they must have already been scraping the bottom of the barrel yesterday but I discovered that they have dragged up some quotes from Louise Mensche for today’s edition so, sadly, it would seem that there are no limits to the depths that the Mail is happy to sink to in order to justify itself. If Campbell’s assertions during the interview are to be believed, this may be Paul Dacre‘s last gasp at threatening our political leaders over Leveson press reform although it is being widely reported this evening that, in a typical “up yours” Daily Mail gesture to its critics, Dacre may have had his contract extended rather than terminated as had been widely expected.